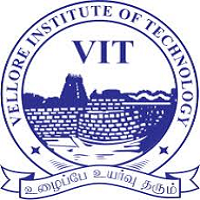 B.E /B.Tech M.Sc. M.Des M.E /M.Tech. This College is accredited by NAAC A (National Assessment and Accreditation Council) validity is 26 Nov 2022 and the score is 3.11 . 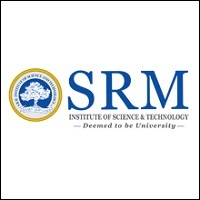 One of the best college for computer science students. I am pursuing my Bachelor degree from DA-IICT. I will graduate from ICT branch in May 2018 and the degree has already created a very positive impact on my career. I can honestly say it was a wonderful experience being in DAIICT. DA-IICT has good culture in competitive coding, developing and in research as well. Most of the professor are supportive and help students. The administrative department is always helpful the student community. The most important part is an environment over here is really very awesome , too much greenery everywhere in the campus DA-IICT has many clubs and committees, those can help students to explore other fields and students can explore their hobbies and improve their skills as well. We also organize different events like drama night, music night, dance night and also celebrate many festival in collage. 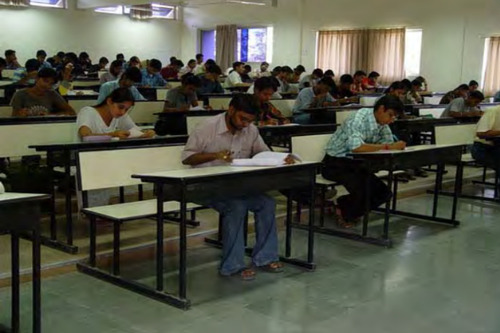 There are many things which makes this college perfect environment for an overall development of a student. DAIICT has a culture where we have a self dependent student body which addresses to the issues of the students and works for their betterment. Name an activity and you can find a club for that at DAIICT. More than 25 cultural activities happen round the year. One of the best annual festivals across Gujarat. Apart from the extracurriculars, DAIICT has the finest coaching and some extraordinary professors. This place brings the necessary change in you. Placements : The first thing while looking for a college is its past placement statistics. DA, as it is popularly known will not disappoint you. More than 60 companies paid a visit during the 2016-17 placements, offering both internships and full-time jobs. A wide range of companies (both American and Indian) has recruited the final year students. Some of the big names in the process are Amazon, Morgan Stanley, Direct i, Sprinklr, FactSet, Samsung, Practo, SAP Labs, Enduance, etc. The list runs quite long Most of the companies look for desirable software engineers who hold a strong base in data structures and algorithms. DA has achieved almost 100% placement in 2016. The highest salary offered is 40 LPA, the average salary is 6.5 LPA, and the lowest salary is 4 LPA. The highest stipend for the internship is Rs.15,000/month and the lowest stipend is Rs. 10,000/month. Furthermore, Amazon, Direct i, Sprinklr, Adobe, etc even provide summer internships for the pre-final year students. (unpaid) Infrastructure : The founding fathers of the college wanted to keep its students really close to nature. The sprawling 60-acre campus is full of trees and plants giving peace to the mind. You can even notice a lot of wildlife on campus like peacocks and monkeys. It's really peaceful and instills necessary values for all-round holistic development. DA comprises of HoR Men and HoR Women. The men's block has 7 interconnected wings namely A, B, C, D, E, F, G, H each comprised of three floors.The women's block has 2 wings (as there is a 7:3 boy to girl ratio here). The bathrooms in both the HoR's are pretty well- maintained, each floor in every wing has a water cooler providing drinking water 24 hours. The hostels provide hot water facilities during the winters. Coming to the internet facilities, every room(shared by two) has two LAN ports providing 10 Mbps speed with a daily quota of 10 Gb. Furthermore, every building (labs, CEP, classrooms, cafeteria ) is well-connected to Wi-Fi. The rooms are not so satisfactory. They are quite cramped and some are really old with poor maintenance. Both the HoR's have a TV room, which you may use at any point of time. Coolers are only allowed during the summer, however, you may use a table fan throughout the year, whenever you wish to. We do not have wardens here and no roll calls at night. Although the ladies have an in time at mid-night. We believe in having freedom and till date, it has never been misused. We even have a necessity store inside the hostel having day to day needs from notebooks and pens to cold drinks and chocolate. Lets have a look at the canteens. We don't have a mess system here, we practically pay everytime we have a meal. We have a wide range of stalls here. They all serve food at a very low and adjusted rate providing wholesome meals. We have a south-Indian stall as well serving South delicacies. We have a non-veg stall too, though not that popular as veg suits the climate out there. There are many outlets just outside the campus to fulfill your tummy too. Moving onto classes, we have lecture theaters here, popularly known as " LTs ". There are three LTs, with two being non-AC and one is air-conditioned. Each LT has a capacity of about 350 students in one go. The LTs do need renovation as the ceilings generally leak during the monsoons.W e have a SAC(student activity centre), a club house and a gigantic football/cricket and two basketball fields. Faculty : All the professors are Ph.D. holders here and have completed their programs from reputed institutions from abroad. Most of the faculty members do not take attendance here and even the course struture and academic schedule is designed by the course instructor. Some of the professors here are really astonishing, having such skills which will leave your mouth wide open. While on the other side of the horizon, some of them are really a waste as they make your life a living hell and you end up not learning anything. The grading system is completely dependent on the instructor and can vary from time to time. Most of the professors here are pretty chilled out . I remember playing chess with my data structures professor in the canteen once over a cup of tea. The are helpful both in and out of the classroom. Coming over to industry exposure, it is quite limited here according to me. Other : Medical facilities: Hor-Men has a doctor's chamber where both men/women can come to get assistance. There are two shifts when the doctor visits, once in the morning and once in the evening. They provide the medicine there itself and you do not need to pay extra. Anything under Dhirubhai's name is Excellent! One of the best college life experience one can ever get. The curriculum which is specially designed only for Information and Communication Technology study. There are no other common branch subjects so you stay focused to your branch from the first year only. The college with best placement in Gujarat. One of the best infrastructure and compulsory hostels. 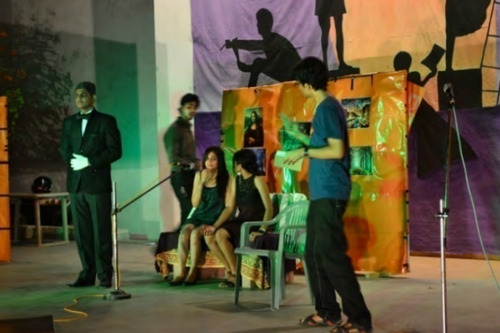 Experienced faculty and good arrangements for co curricular activities. Admission ends at high rank so there is quality in the crowd. DA-IICT is a very good college.It has nice infrastructure. You can enjoy study as well extra curriculum activities in this college.DA-IICT has very good atmosphere for whom,who want to learnt programming very well.It has very healthy campus life.Different kind of festival celebrated here during the year. Faculty is very good and supportive.You can explore yourself in many different field. what will be expected percentile and marks in jee mains to get adimission into DAIICT? will i get admission in DAIICT if my jee mains april score is 175 and expected percentile is 98.1 according to career360? 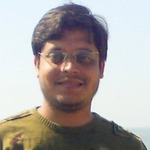 My PCM score in gseb is 260. So what is the score I have to in gujcet to get admission in DAIICT. 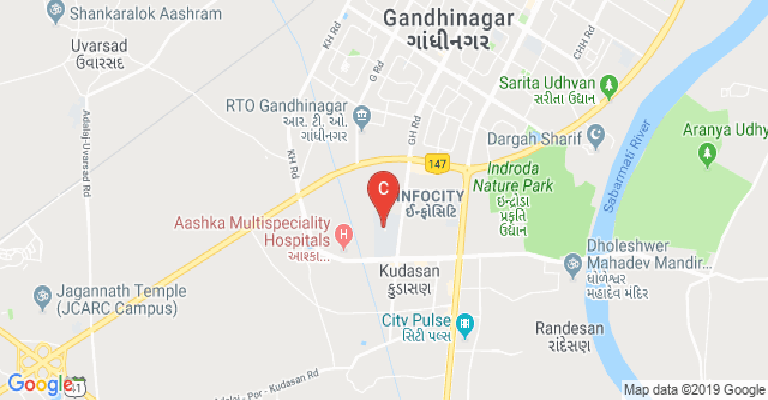 The Dhirubhai Ambani Institute of Information and Communication Technology (DAIICT) is located in the city of Gandhinagar, which is the capital of Gujarat. It was established in the year 2003. It is of course named after one of the greatest business tycoons from India- Shri Dhirubhai Ambani. He was from the state of Gujarat itself and founded the Reliance Industries. The Dhirubhai Ambani Foundation has been behind the establishment of this institution. This foundation is now promoted by his younger son Anil Ambani. The beautiful campus stretches over fifty acres of land. Gandhinagar’s proximity to the business centre of Ahmedabad helps the college immensely in having an excellent industry outreach. The DAIICT is recognized as an autonomous institution by the UGC (University Grants Commission). 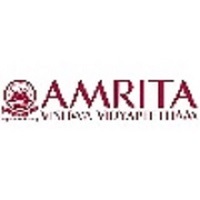 The courses are ratified by the AICTE (All India Council for Technical Education) while the college is also a member of the AIU (Association of Indian Universities). The college has also been accredited by the NAAC (National Assessments and Accreditation Council), earning an A grade rating in the latter. A separate IQAC (Internal Quality Assurance Cell) has been created to this end, to ensure that all the terms of the NAAC are complied with. An AQAR (Annual Quality Assurance Report) gets generated to quantify the results. The entire focus of the academics at the DAIICT, as the name suggests, is towards the area of Information and Communication Technology (ICT). The college even has its own IPR (Intellectual Property Rights) Policy. Courses offered here, are right from the UG till doctoral levels. At the undergrad level, there is the B. Tech in ICT. This may be done in itself or in combo with Computational Science as a minor. Likewise, the M. Tech may be taken up in the same field of ICT. An MSc. may also be pursued for the related area of Information Technology (IT). The M. Des may also be undertaken in the area of Communication Design. Beyond this, doctoral programmes may also be pursued from the DAIICT in Gandhinagar. Admissions to all these programmes is on the basis of merit. Scores of nationally recognized entrance exams are also considered. A detailed Statement of Purpose (SOP) is necessary before the screening interviews. The college also realizes the importance of use of such ICT in academics. This is why, several of the courses may also be accessed using an online portal on Moodle. Research forms a key part of the Gandhinagar- based Dhirubhai Ambani Institute of Information and Communication Technology. Some of the major areas on which the research has been done includes- natural information processing, next generation wireless systems, speech processing, sensor networks, pattern recognition & image processing, distributed databases, VLSI, wireless communication and for computational science. The use of ICT in agriculture and rural development is also of much concern. Several centres of excellence have also been curated on campus. One is the GPU (Graphics Processing Unit) Education Centre. There is also the Centre for Entrepreneurship and Incubation. It helps develop the budding entrepreneurs among the students for the institute. Experienced trainers and entrepreneurs are invited to campus to deliver guest lectures and interact with those who have such business models. There is also the Continuing Education Programme (CEP) offered by the DAIICT. This is a platform for distance education to be pursued by those unable to take up regular programmes. A lot of working professionals seeking a skill upgrade, enrol for this programme. Several of the faculty members have also been published on recognized academic and research journals. The college has also taken up several research projects in collaboration with other organizations or industry bodies. 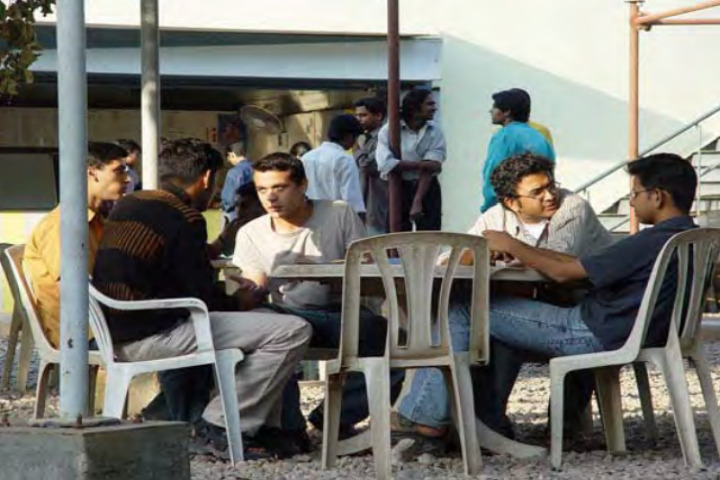 Some of the collaborators from where these research assignments have originated from include the likes of- ICSSR (Indian Council of Social Science Research), ICPSR (Inter- University Consortium for Political and Social Research), DST (Department of Science and Technology), SERB (Science and Engineering Research Board), ISRO (Indian Space Research Organization), BRNS (Board of Research in Nuclear Science), IFCPAR, NBHM (National Board of Higher Mathematics), GUJCOST (Gujarat Council on Science and Technology), DIT (Department of Information Technology), DAE (Department of Atomic Energy) and many more. All this and more has led to the Dhirubhai Ambani Institute of Information and Communication Technology getting extremely good rankings across platforms. The NIRF (National Institutional Rankings Framework) given by the MHRD (Ministry of Human Resource Development) has placed the DAIICT at the 70th rank among engineering colleges. The placements have likewise been extremely healthy here. 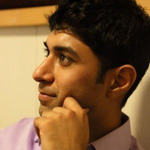 Some of the key recruiters in recent seasons have been the likes of- Amazon, Morgan Stanley, LinkedIn, Futures First, Deloitte, Factset, Endurance, Sprinklr, Qualcomm, Microsoft, Oracle, Practo, Google, Yahoo, Flipkart, TCS, GRIT Technologies, Sapient, Cybage, Success Factors, Open Silicon, Kuliza, Airvana, BIT Mapper, Thorogood, Cognex Datamatics, Ki Vi Technologies, Aspiring Minds, Mu Sigma, Infi-beam, Infosys, Samsung, MAQ Software, ZS, OPS Hub, Interview Street, Goldman Sachs, Nagarro and many more. This College is accredited by NAAC (National Assessment and Accreditation Council) A validity is 26 Nov 2022 and the score is 3.11 . Boys Hostel :i. Number of hostels - 9 Blocks (including Club House) ii. Number of inmates - 930 iii. Facilities - Wi-Fi and wired internet connection, Toilets and bathrooms with hot water facility, General Stores, Health Centre, Bank ATM, Book Stall, Gymnasium. 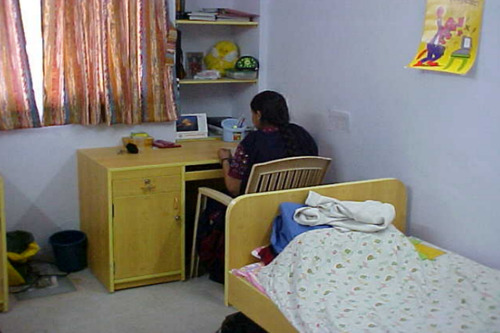 Girls Hostel :i. Number of hostels - 2 Blocks ii. Number of inmates - 337 iii. Facilities - Wi-Fi and wired internet connection, Toilets and bathrooms with hot water facility, General Stores, Health Centre, Bank ATM, Book Stall, Gymnasium. Medical/Hospital :The Institute has a Medical Centre. There are two doctors visiting the centre at specified hours and the students can consult them without any charge. DA-IICT has arrangements with the Apollo and SAL Hospitals which allows the students to be admitted on concessional rates without advanced deposit. All students are covered under the Group Mediclaim Insurance Policy and Personal Accident Insurance Policy. A cashless transaction facility has also been provided to the students under the Mediclaim scheme. 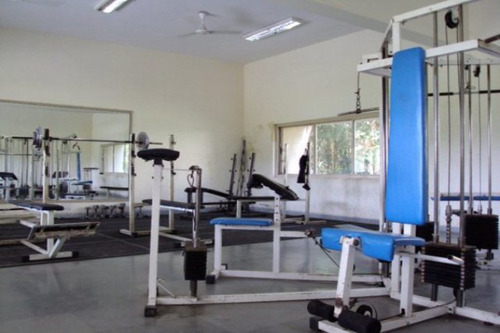 Gym :Well-equipped Gymnasium and Yoga hall on the first floor of the sports complex. Library :The collection of the Resource Centre is current and compact. The collection encompasses subjects in computer science, computer engineering, electronics, communication technology, information technology, basic sciences, design, animation, humanities and social sciences, management and related areas. This collection includes books, conference proceedings, reference books, CD-ROMs, floppies, VCDs, DVDs, Video Cassettes etc. 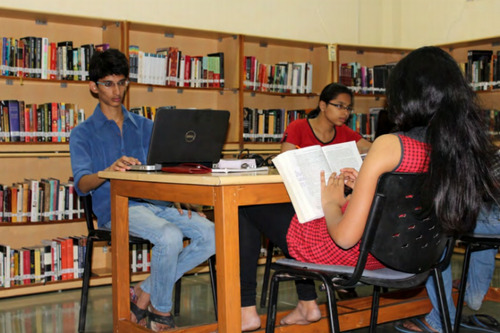 Resource Centre receives 196 print journals and provides access to over 1036 electronic journals on regular basis. Resource Centre provides online access to the major digital resources which includes ACM Digital Library, ASABE Technical Library, Computing Review, IEEE/IEE Electronic Library (IEL), IEEE ComSoc Online Tutorials, International Telecommunication Union-Recommendations: Online, JSTOR Collection, Lecture Notes in Computer Science Collection, Springer Online Engineering Collection and USENIX Publications. 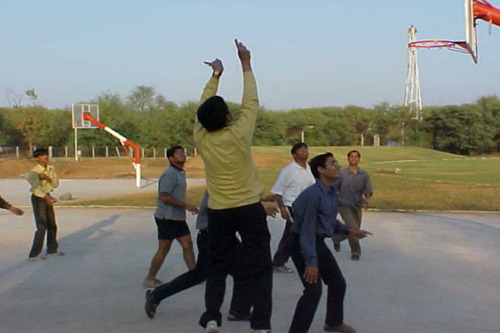 Sports :The Sports and Cultural Complex has facilities for outdoor sports such as cricket, football, basketball, volleyball as well as indoor games like badminton, table tennis, chess, and carom. It also has a gymnasium and a music room. I.T Infrastructure :In the era of Information Technology, communication and network constitute the core of the information exchange. This has been visualized in every corner of the Institute through the networking map. DA-IICT has a modern, eco-friendly, fully networked campus with optical fiber cable connectivity between buildings. It has state-of-the-art IT infrastructure, computing and communication resources, electronic access controls and a payment system through smart cards. More than 1200 nodes connected via 100 Mbps switches and a 1 Gbps Fiber backbone form the superstructure of the network. Each Computer is at least a Pentium IV multi OS, fully connected terminal. Thus ensuring that there is atleast one high-end computer available to each student and faculty within the campus. Each terminal is not only loaded with the basic softwares, but also allows students access to the more sophisticated design tools. Laboratories :The labs provide extensive research facilities due to their classifications and specializations on the basis of the research to be carried out. The lab structure has been divided into the following categories. The MMD Labs: The Multimedia Labs, these labs have state-of-the-art equipment to allow designers to truly harness their creativity without having to worry about technical difficulties. With a main Apple Xserver having a 2.5 Terabyte capacity, Apple iMate, iBooks (G5) and HP based high end systems this lab has systems to cater to all needs. The softwares available to students in this lab include those like Apple Works, Maya, Adobe Photoshop CS2, Sony Soundforge Pro, AutoCAD and 3DMax. The Sound Studio of this lab is at par with any international standard. The Grid Lab: The Grid lab consists of a grid of 20 dedicated servers build using Globus toolkit. This lab is where most of the current research into Service Oriented Computing and distributed computing especially different grid architectures take place. The Networks Lab: The Network Lab allows students to operate and configure networking equipment like Routers, mail/http/name servers, and to use and create wireless networks. The availability of LAN trainer kits and network simulators ensure that students have all the tools required to fully understand the concepts behind what they are doing. 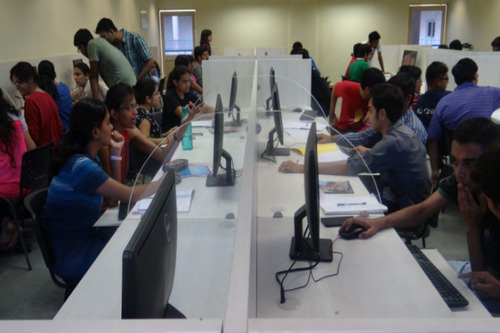 The VLSI Lab: This consists of three labs: the two main labs have complete access to the tools required for design and implementation in VLSI including access to Xilinx FPGAs, Mentor Graphics tools (multi-user licenses) and Cadence tools.